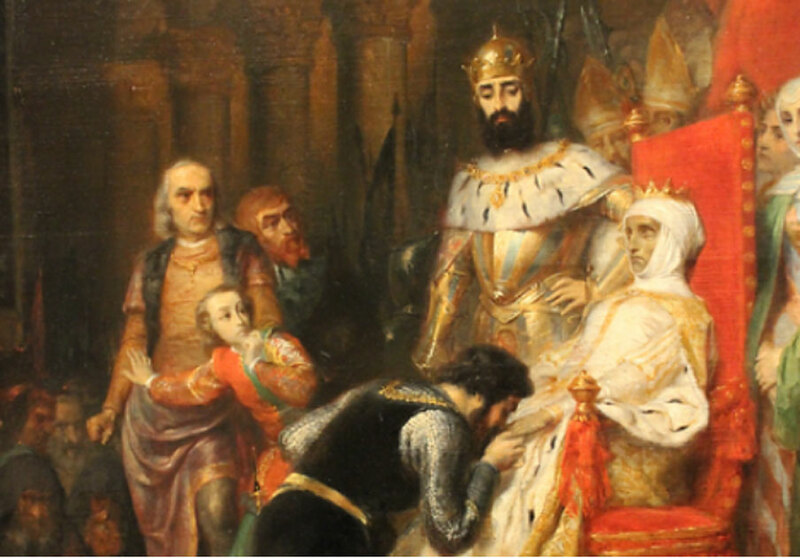 According to legend, in the mid-14th century a heart-broken King Peter (Pedro) I of Portugal exhumed the corpse of his lover to have her posthumously crowned queen. The romantic scandals of European royalty could fill a library so it can be difficult to find a story of a torrid liaison that stands out. But the tale of the coronation of Inês de Castro , the Corpse Queen of Portugal, is difficult to forget. Inês de Castro was born sometime in 1325 to a noble family of Castilian descent from the Kingdom of Galicia , which was located in the northwestern part of the Iberian Peninsula. In 1340, when she was just 15 years old, Inês was sent to the court of Crown Prince Peter I of Portugal to be the lady-in-waiting to his wife, Constanza of Castile. However, the Peter and Inês fell in love and they started an affair. Constanza died five years later, in 1345, shortly after she gave birth to Ferdinand I , who was the future king of Portugal. After Constanza’s death, Peter asked his father, King Afonso IV , for permission to marry Inês. Afonso hoped to make a better match for his son and wanted his affair with her to end. So, in addition to refusing his son’s request, Afonso banished Inês from court. But her exile didn’t prevent the couple from continuing their relationship. Peter and Inês moved to a villa near Coimbra that was dramatically dubbed the Villa of Tears. Between 1346 and 1354, Inês and Peter had four children, though only three survived infancy. King Afonso IV and his advisers were afraid that Inês’ relationship with Pedro gave the Spanish influence over his son. So, he sent three assassins to Inês and Peter’s home in 1355 to put a violent end to their illicit affair. When the killers arrived at the villa, they found Inês and her children sitting near a fountain but Peter was nowhere to be found. Some sources say that she was stabbed to death another says she was beheaded in front of her children. Inês’ body was eventually buried at the Monastery of Santa Clara in Coimbra. When Afonso died in 1357, Peter inherited the throne and immediately set about getting revenge. He brought two of Inês’ three murderers to justice and had their hearts ripped out while he watched. Peter declared that he and Inês married in secret and that she was the rightful queen of Portugal. He then ordered that her corpse be crowned during his coronation ceremony (another article says that her body was exhumed and crowned in 1361). While this gesture was romantic, albeit creepy, it was also practical because it was attempt by Peter to legitimize his children with his lover. 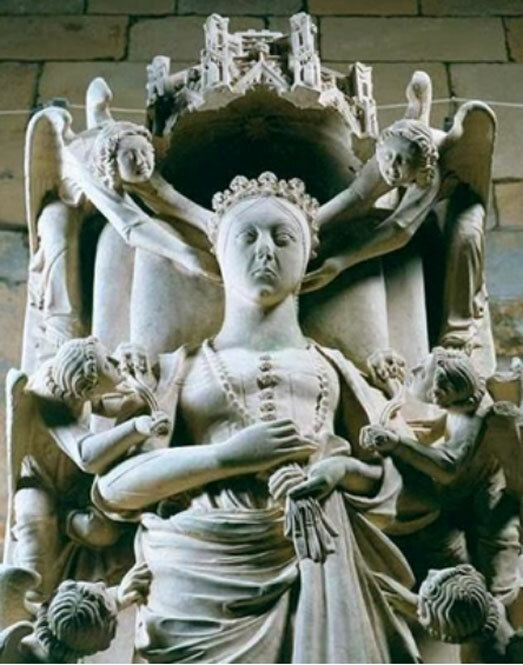 Inês’ decomposing body was clothed in royal robes, a crown was placed on her head, and she was placed on a throne next to Peter in the Cathedral of Coimbra. Then he made all of the nobles line up to kiss her decaying hand. After the ceremony, Inês’ body was taken to the Monastery of Alcobaça and placed in a tomb with her effigy. Her tomb faces Peter’s so they will rise facing each other during the Last Judgment. Many people believe the coronation of the Corpse Queen of Portugal is merely a legend and didn’t happen. This is probably because the idea of exhuming a dead body for a ceremony seems ridiculous. But the Catholic Church actually exhumed a dead pope for a trial known as the Cadaver Synod in 897 and asked him questions. So, the coronation of a dead queen is no less believable. The above article, originally titled ‘Halloween Horror Post #1: The corpse queen of Portugal’ by Dolly Stolze was originally published on her blog Strange Remains and has been republished under a Creative Commons License.